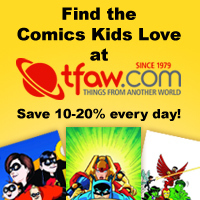 The TFAW Progressive Sale Is 70% Off Starting 11/21!! If you’ve been looking for a great online comic book store, look no further. Things From Another World is the premier retailer of comics, toys, collectibles, and more. Visit one of their four local comic book shops in Oregon and California, or order online, and they’ll carefully pack and ship your Comics and Graphic Novels right to your door! Visit Things From Another World for a massive selection of Star Wars, Hellboy, Manga, Superheroes and other pop culture favorites. Hot New Holiday Toys and Collectibles! Watch this space for next month’s Specials!